While the mountainous West Coast has plenty to offer for hard-core adventure seekers, it’s also a destination for lovers of gorgeous landscapes, lounging lakeside, rustic cabins, relaxing fireside and, of course, top-notch cuisine. Whether experiencing the great outdoors for you means rock climbing and jet skiing or alternatively popping open a bottle of bubbly in your hot tub, these five hotels will make sure you get your fill of the Wild West, while eating like royalty. Surrounded by the White River National Forest, Park Hyatt Beaver Creek offers views of the Beaver Creek Mountain. From snowshoeing and snowboarding in the winter, to hiking, mountain biking and river tubing in the summer, Beaver Creek has more than enough activities to keep anyone active. Come sundown, guests can indulge with the resort’s complimentary gourmet s’mores happy hour at the fire pit. Along with your milk chocolate and graham crackers, the chef’s handmade marshmallows (think Grand Marnier and raspberry) take the experience to the next level. 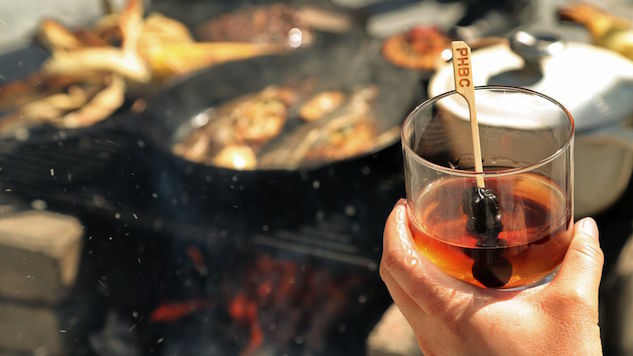 Guests can try their hand at shaking up a smoked ice cocktail using oak, hickory or mesquite wood chips to smoke their own ice over an open fire, which ultimately enhances the final beverage with smoky notes. Or choose to indulge on amped-up smoked mac n’ cheese. Once guests have their individual pans ready and filled with a noodle base, a heavenly cart complete with an array of cheese — smoked cheese sauces and crumbled toppings including parmesan, blue cheese, Parmigiano-Reggiano and more — comes around, along with tasty ingredients such as bacon and sausage, allowing guests to customize their individual dish. The pan then gets placed over the open fire to cook, creating the perfect, gooey, personal pan of mac n’ cheese to pair with the smoky cocktail. Located near downtown Aspen, Viceroy Snowmass sits in the center of Snowmass’ new base village. For the thrill seekers, this mountain resort offers a variety of activities, each tying back to an authentic aspect of life in the Rockies. From sunrise paragliding where guests begin the day with a spread of breakfast items before taking off on an exhilarating flight, to guided mountain biking complete with homemade energy bars, there’s zero chance of not breaking a sweat. That said, Viceroy Snowmass offers guests the chance to wind down with a fly-fishing trip in a secret, local hotspot accompanied by Chef Will Nolan. After your fly-fishing course, prepare yourself for a fresh fish dinner and join Chef Nolan in the kitchen for a private lesson and gourmet meal involving the evening’s fresh catch. Set in the foothills of the picture-perfect Cascade Mountains, Sunriver, Oregon, boasts 300 days of sunshine and a climate ideal for a variety of outdoor activities. Think: world-class golf, tennis, kayaking, fishing and rock climbing … the options are endless. Sunriver also features a plethora of dining options. Brew enthusiasts won’t be disappointed by its cruise & brews program, in which guests ride bikes along the Deschutes River or among the pine trees on more thab 40 miles of paved bike paths on the resort’s property, all while learning about local brews. The ride ends at The Backyard behind the main lodge, which showcases 16 regional brews on tap, where guests are invited to a flight of cold brews. Sunriver is located right by some of the top trout rivers around, The Deschutes. Book a private fishing experience along The Deschutes, where upon returning to the hotel, Executive Chef Travis Taylor will have a basket of goodies ? think spices, rubs, local beer and wine pairings ? for you to create a trout meal of your own in your in-room kitchen. The Park City area features some of the most scenic terrain for mountain activities ranging from stand-up paddle boarding and river rafting to hot-air balloon rides and horseback riding. With that in mind, the Waldorf Astoria provides exceptional experiences to best take advantage of that fact! Utah is one of the top fly-fishing destinations in the U.S., and, as such, Waldorf Astoria Park City’s seeks to provide guests with the angling trip of a lifetime. With a private guide, fishing hole tips, unparalleled scenery and beautiful rivers, guests return to Waldorf Astoria Park City where a local trout is then prepared into a gourmet dinner by the head chef — you can even choose to have the chef prepare the meal in your suite. Interested in the beer creation process? Take part in Waldorf Astoria’s brew master program, which allows guests to experience the hops and carbonation process, then learn about the canning and distribution at Park City Brewery’s tap room. Enjoy flights of on-tap ales at the brewery along with explanation of tastes and some brews to take home. One of Northern California’s most beloved mountain getaway regions is none other than the idyllic Lake Tahoe. Located at the base of Squaw Valley, the site of the 1960 Winter Olympics, this resort offers unobstructed views of the snow-capped Sierra Nevada Mountains and ski-in and ski-out access to squaw valley | alpine meadows. From its championship golf course; heated swimming pools; 150-foot water slide; scenic hiking and biking trails; horseback riding; fly fishing classes on the resort’s two private, stocked ponds full of beautiful rainbow trout; and private ice-skating rink, you don’t need to venture far from Squaw Creek to get your fill of Lake Tahoe. Moreover, it boasts six on-site Squaw Valley restaurants, each of which use fresh ingredients from the resort’s on-site hydroponic garden, as well as local ingredients, seasonal fruits and vegetables. This includes their breads and pastries, which are baked fresh daily in the pastry kitchen. Hailing from California, Chelsea Davis is an inquisitive dessert enthusiast and Golden State Warriors fan. Since graduating from Columbia University, she has amassed a colorful professional background, with experiences in industries that include news production, radio, public relations & media communications. Upon realizing that her true passion revolves around traveling the world, immersing herself in new cultures and eating, she is now a full-time freelance journalist, based in New York City. Chelsea’s work has been featured on Thrillist, The Daily Meal, Yahoo! and MSN, among other nationally recognized outlets. Follow her on Instagram and her blog .